Whenever you ask a question about tires, whether you ask about price, load capacity or inflation, the first response may be “What size is it?” The answer you give should not be “It’s a 22.5” or “It’s a 225-R-15.” These are just partial answers and indicate to many that you don’t really understand much about your tires. The reason you need to provide the complete tire size information is simply because there are so many possible replies. Starting to narrow down the possibilities by properly identifying the size is just the first step in learning the details so the person that is offering the help can provide the correct answer you seek and not just a wild guess. Knowing your tire size can be confusing and sometimes it seems as though we tire engineers and government agencies have conspired to make things difficult. What is needed is to remember there are three basic features that must be established first: tire type, tire physical dimensions and tire strength. This article covers a number of different type tires. Please do not skip over any part as the knowledge provided here builds on previously covered information. Let’s start off with TYPE. This is usually a function of the application. For most tires, there is a letter code as the first part of a “Complete” identification of a tire. For most tires sold in the U.S., the code for tire type is either a “P” for Passenger, “LT” for Light Truck, “ST” for Special Trailer, or no letter for commercial or heavy duty. Tire engineers sometimes call these commercial sizes “TBR,” short for Truck Bus Radial. If you are reading this article, most likely you have a Recreation Vehicle or RV of some sort, so the use and application of tires on the various types of RVs will be our focus. There are, of course, many other types of tires. OTR for Off the Road, or AG for agricultural, or AT for All-Terrain, or M for Motorcycle, and others – but we will not cover those and will focus on the type, size and strength tires used in various RV applications. First, we will cover P- (Passenger) type tires. Most of us own or have owned some form of a passenger car that came with P-type tires. Older and smaller trailers may also come with P-type tires mounted by the manufacturer. When our car required replacement tires, we seldom needed to think much about the proper size nomenclature, as it was the responsibility of the tire dealer to confirm the appropriate type and size tire that was needed. Our car tires would probably be identified as a P195/75R15 94S or similar combination of letters and numbers. The P, as you now know, indicates Passenger car application. 195 is the width in mm. Not the tread width but the maximum width. 75 is a ratio of the tire width to the tire height from the wheel to the tread. “R” stands for radial. Since there are very few non-radial “D” or “Diagonal” construction tires, we don’t need to go down the road of old tire construction. The “15” is the wheel size. Finally, there is the “Service Description” which is a combination of “Load Index” number, 94 in our example, and the “S” is the Speed Symbol. In the U.S., the speed symbol is really just an indication of the level of handling capability or steering response with increased handling potential as we move from Q to R, then S followed by T, U, H, V, W, Y and finally Z. Unlike Europe where by law you are required to replace tires with the same speed symbol, we have the option of changing the rating but should expect the steering response to get slower if we go to a lower symbol. 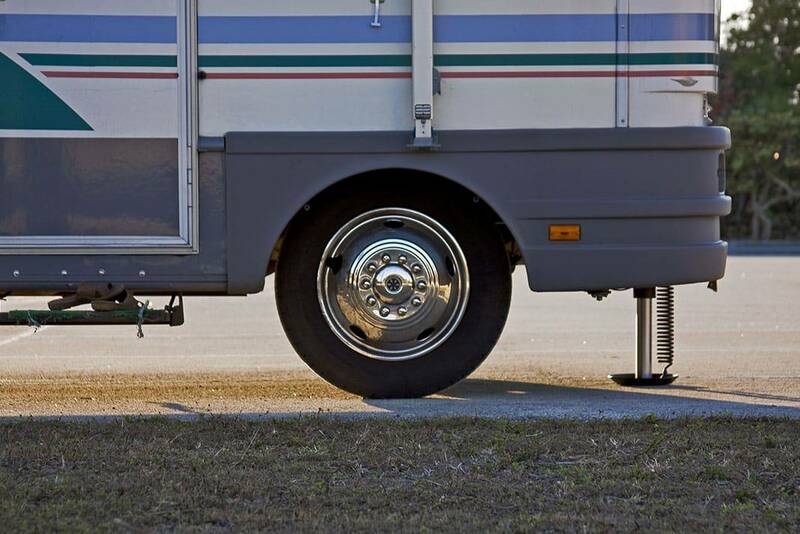 The final bit of information concerning the use of P-type tires in RV application, the load capacity of a P-type tire must be reduced by dividing by 1.10 per tire industry design standards. Next, we will cover ST or Special Trailer tires. This is a special type tire, unique to the U.S. market. It was developed and introduced in the late ’60s for exclusive use on trailers. In fact, it is against safety regulations to use ST-type tires on vehicles designed to carry passengers. In this category, we might find an ST205/75R15 101K LR-C. For these tires the ST205/75R15 101K is similar in meaning to what we saw in the passenger-type tires. The primary difference is that the Speed symbol K, L or R is lower for these applications than for passenger-type vehicles. The K stands for up to 68 mph. Because the ST-type tires are expected to carry higher loads at higher inflation levels, the trade-off is the restriction to be operated at lower speeds. The load formula used by tires engineers when designing ST-type tires is based on a stated upper operating speed of 65 mph. While today highway speeds can be significantly higher than 65, we should remember that when ST tires were introduced we had a nationwide Speed Limit of 55 mph, so a tire design limit of 65 mph was not unreasonable. You should be aware that in 2002 both P- and LT-type tires had the test and durability requirements significantly updated and improved but ST tires only need to pass the same tests as in 1970. In ST-type tires, the abbreviation of LR for Load Range is introduced. You can think of the Load Range as a replacement for Ply Rating. This is really an indication of the strength of a tire to hold the inflation pressure, not the ability of a tire to support additional load. It is important to remember that it is the inflation pressure and not the tire construction that supports the load. This is why we have Load and Inflation tables not Load and tire construction tables. For RV application you will see that Load Range starts at C (old 6-ply rating) and moves through D, E, F and G. Basically the Load Range identifies the highest level of cold inflation to be used starting at 50 psi and moving up to 100 psi or even higher, as identified on the sidewall of your tires. Unlike the Speed Symbol, you should never consider moving to a lower Load Range than selected by the RV manufacturer. The Load Range along with the original size, inflation level and type tire is shown on the RV Certification Label that the RV company applied to your RV. The next type tire is LT or Light Truck. These will be found on both Class B and Class C and possibly a few small Class A RVs. Since these RVs are larger and heavier, they will normally come in larger physical size and stronger Load Range. For example, a popular tire for a Class C motorhome might be an LT225/75R16 115/112 LR-E. The double number 115/112 is the different Load Index for single (front) application and dual (rear) application where two tires are mounted side by side. The Load Range (ply rating) has the same meaning as it does for ST-type tires. As with the ST-type tires, you should not consider moving to a lower Load Range than selected by the RV manufacturer. The LR along with the original size and type tire and minimum inflation are shown on the RV Certification Label. These tires seldom come with a Speed Symbol, but if you review the Data Books from the major companies that make most of the TBR tires you will see that they specify 75 mph as the maximum operating speed level. The double Load Index numbers 139/134 relate to the single and dual application and the Load Range letters continue to identify the normal upper level of cold inflation pressure. There is a lot more information on tires available in tire Data Books and Industry Standards organizations. You do need to be careful about the source of the information you are relying on. Some sources, as in tire industry publications, can normally be relied upon as accurate but even there the information may not be aimed at the specific and sometimes unique needs of the RV community. There are many forums on the internet with hundreds of self-appointed “experts.” We need to be careful as just having used or sold tires for decades does not mean that all the information from that person can be relied upon all the time. Read more from Roger Marble on his blog at RVtiresafety.net. Next articleHow has your RV performed based on your expectations when you bought it? Do you have “big wheels” on your car or tow vehicle? Why? Do you need an external spare tire cover? Valve stems, cores and caps, “Oh my!” – And how tight is “tight enough”? How much “reserve load” or “headroom” is enough in a tire? Are ST tires the “best” tires made? Optimum, appropriate or required inflation? What’s on a tire placard? I got a quote for a new set of tires for my class C a few weeks ago from Americas Tire. The price was alright, but I completely lost confidence in that branch when I had to explain to the kid behind the counter the difference between ‘P’ and ‘LT’. Ya, sometimes counter people are really just “order takers”. Hopefully the “kid behind the counter” learned something from you. So many changes since the 825×14 Goodyear Power Cushions, or Firestone 775×15 or even the BFG.875×15 tires from the 60s when I started working in tire shops at 15 years old. Remember when “Armstrong — Grips the Road” commercials? Or changing the early ‘deep bead’ 14s from the back side and learning how to change 16″ split rims or even 20″ double ring split rims (very carefully). Yes, Wayne. When I started as a tire engineer I spent a lot of time with the 20″ multi-piece rims. Glad I had some of the more experienced guys drill the need for “do the job correctly” into my head. People just don’t appreciate the explosive energy available in those old systems.